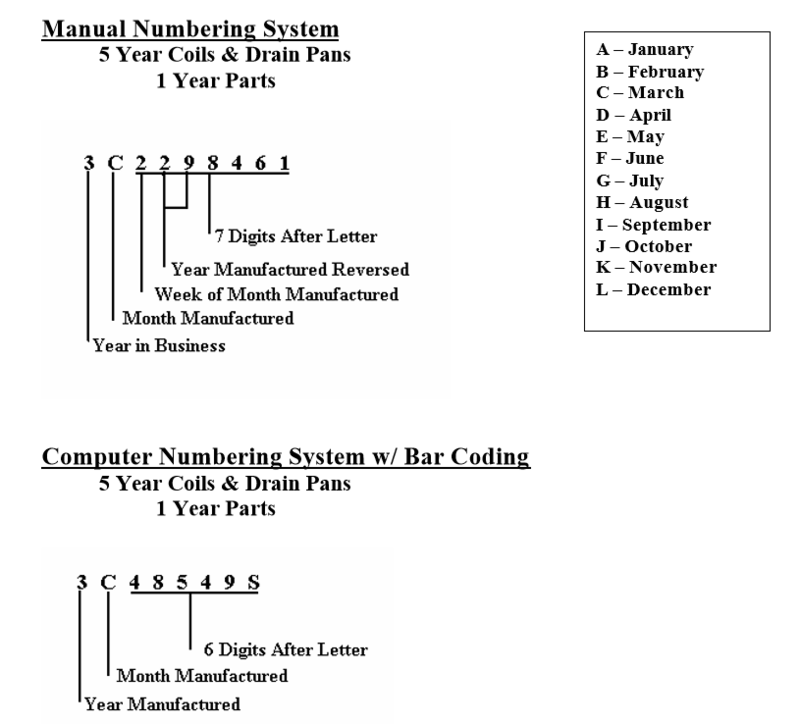 Obsolete Brand Name of AllStyle Coil Co., L.P.
How to determine the date of production/manufacture or age of Lendell® HVAC Systems. The date of production/manufacture or age of Lendell® HVAC equipment can be determined from the serial number located on the data plate. Parent Company: AllStyle Coil Co., L.P. Style 1 – Description: Nine (9) character Serial number begins with one (1) numerical digit followed by one (1) letter and ends with seven (7) numerical digits. Year of manufacture can be determined by using the 4th – 5th numerical digits. See chart below (Note: The numbers are reversed….i.e. in the sample number above the 4th and 5th digits are “29”. When you reverse the number to “92” you can determine that your unit was manufactured in 1992. Month of manufacture can be determined using the 2nd letter digit. See chart below to decode. Style 2 – Description: Eight (8) character Serial number begins with one (1) numerical digit followed by one (1) letter then six (6) numerical digits and ends with one (1) letter.